Can you believe it? There are less than 3 weeks left until Christmas! How did this happen? This year, I’ve teamed up with over 35 other bloggers for Christmas Week–welcome to Day 1!! Started in 2012, and hosted by Kim of Cravings of a Lunatic, we’ve all pitched in to make your Christmas merry and bright with an awesome giveaway! If I were eligible, I would be on top of this, because someone will be downright celebrating when s/he wins this! Well, 3 someones, actually!! It might as well be cold hard cash that we’re giving away–you can get practically anything on Amazon.com, including renting goats to mow your lawn! Don’t forget to enter in the Rafflecopter widget at the bottom of the page! Check back with us throughout the week, as there will be new holiday-themed recipes every day to tempt your taste buds! Today, I’m starting with Peppermint Bark, which is fantastic for gift-giving, or hoarding for yourself! It’s also very easy to prepare! 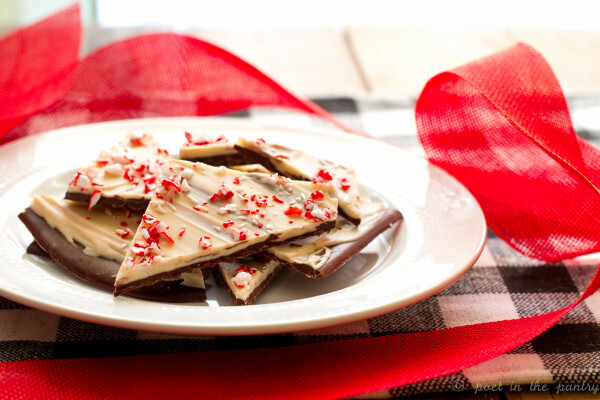 If you know how to temper chocolate, your Peppermint Bark will be stable at room temperature. Me? I’m all for simplifying my life, and while my method includes a pseudo-tempering step, that’s more for allaying my concerns about keeping the chocolate from burning than actually lending that beautiful sheen and snap you get from tempered chocolate. Feel free to disregard my advice and melt all your chocolate at once, if that works better for you. As long as you store the bark in the refrigerator, it won’t matter either way. Just promise me one thing? Do not use candy coating wafers. Do. Not. Use. Candy. Coating. Wafers. They look pretty, yes, but they do not taste all that great. They’re okay for molded pops for children, and I’ve made quite a few of them. 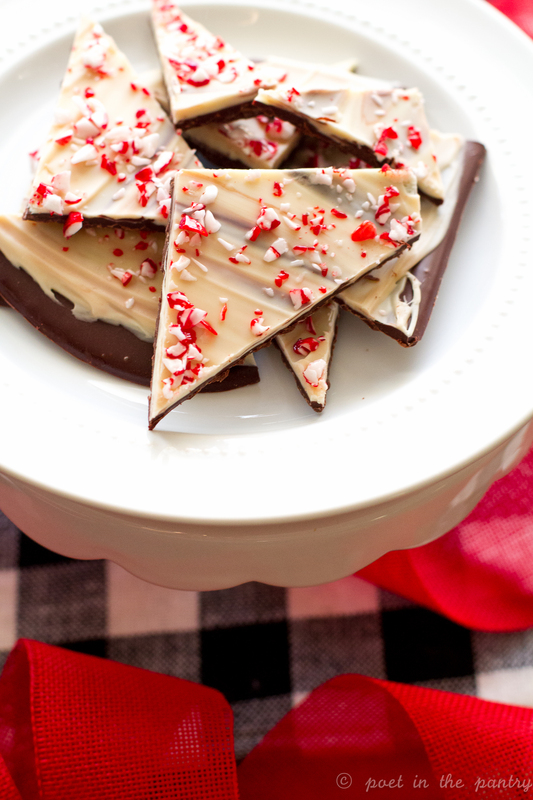 But you want this Peppermint Bark to taste great, and you’ll get just the opposite with candy coating. Stick with the good chocolate. 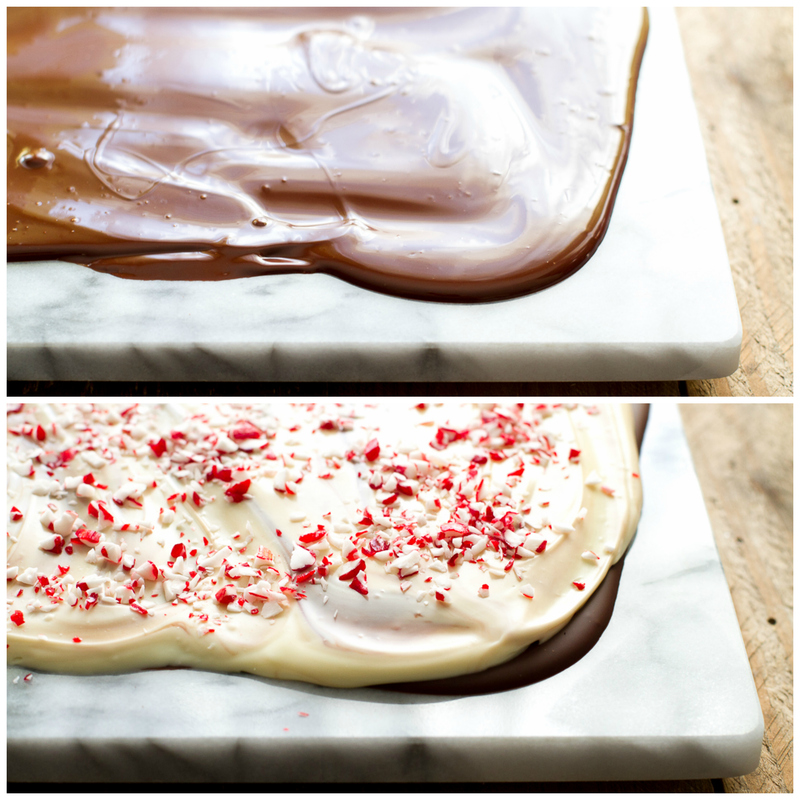 While I did prepare my Peppermint Bark on my marble board so it would look nice and pretty for you all (and it does, doesn’t it? ), and that really is a function for a marble board, instead of keeping it purely for fashion, it’s easier to remove from parchment than marble. If you choose to use marble, give it a little time to soften up after removing from the freezer, and you will probably need to loosen the suction between the board and chocolate–very gently–with your offset spatula. Use it upside down for best results. Check back on Wednesday and Saturday for my next installments to Christmas Week! Chop the bittersweet chocolate and microwave 10 ounces of it a 2-quart bowl in 30-second intervals, stirring between each, until fully melted. Add the remaining 2 ounces and stir until smooth, then stir in ¼ teaspoon peppermint extract. Line a rimmed baking sheet with parchment paper and use an offset spatula to spread the chocolate over it in an even layer. Place in the freezer for 5 minutes. In the meantime, chop the white chocolate and microwave 10 ounces of it in a 2-quart bowl in 30-second intervals, stirring between each, until fully melted. Add the remaining 2 ounces and stir until smooth, then stir in ¼ teaspoon peppermint extract. Remove bittersweet chocolate layer from the freezer and spread the white chocolate over it with an offset spatula. Work quickly so the base layer doesn't mix in with the white chocolate too much; it's okay if it swirls a bit, but you don't want to mix the two layers too much. Sprinkle the crushed candy canes over the surface. Place in the freezer until fully set, about 20-30 minutes. Remove and cut or break into smaller pieces. Store in an airtight container in the refrigerator. You can throw unwrapped candy canes in a zip top bag and smack them around a bit with a rolling pin or meat tenderizer to crush them, but I'm lazy. I bought a jar of precrushed candy canes to use in this recipe. Now, for those amazing prizes! 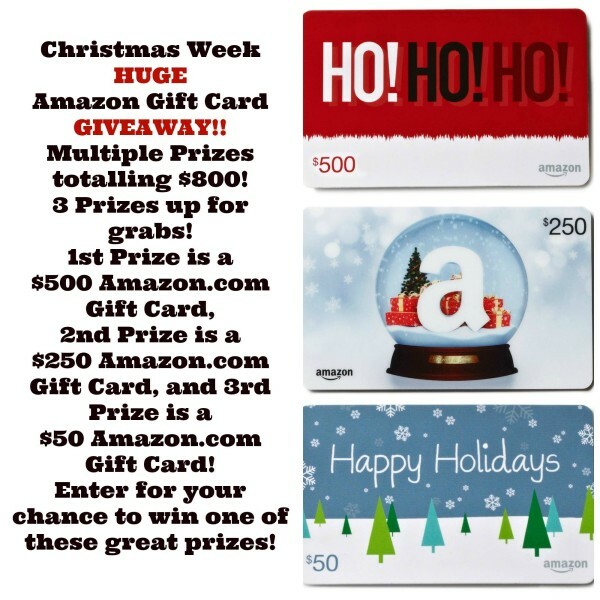 The Christmas Week Amazon Gift Card Giveaway is open to residents of the United States and Canada. Giveaway will run from December 7, 2015 to December 31, 2015. Winners must be 18 years of age. Winners will be notified by email. Winners will be asked a skill testing question. My Swedish Christmas Cookies! Shortbread dipped in chocolate with festive sprinkles! I just recently made mint chocolate truffles for the first time and I would definitely say that they are my favorite holiday treat! They are super easy to make! Once you realize how easy they are to make, you wonder why you never did before! Wow! So many great holiday recipes…thank you! My favorite sweet treat is rocky road candy! My favorite sweet treat to make during the holidays is gingerbread cookies! I’m a huge fan of those, too! So perfectly seasonal! I love snowball cookies for the holiday season! Those are definitely on the list to make every year. It’s not Christmas without them! 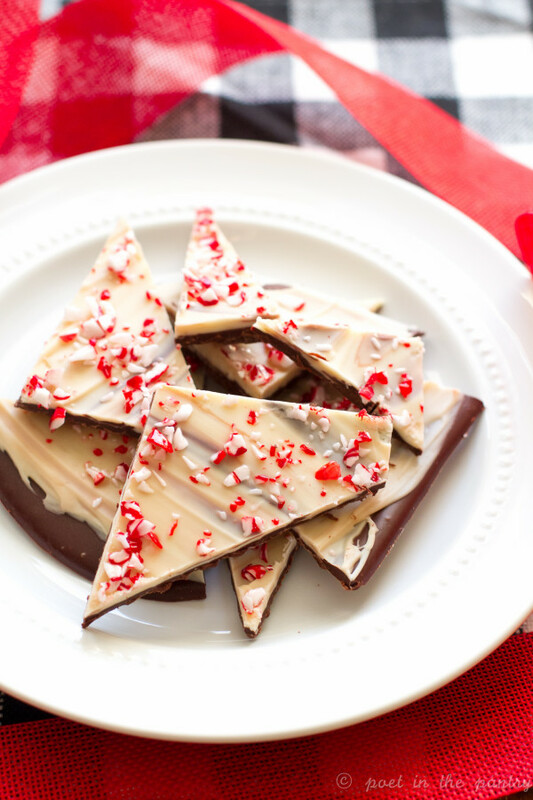 Chocolate bark is one of my favorite Christmas treats! I make white chocolate peppermint bark every year, but you’ve inspired me to try a two toned bark! Yours looks PERFECT!!! I will be making some of your recipes. I LOVE this! 🙂 Hope you enjoy them! For holiday months, I could pretty much live on thinly rolled out sugar cookies. For breakfast, lunch and dinner. Don’t judge! 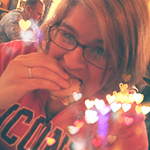 No judgment here–I love them, too! Muddy Buddies and Old Fashioned Butter Cookies…from a recipe that goes back to 1950!! 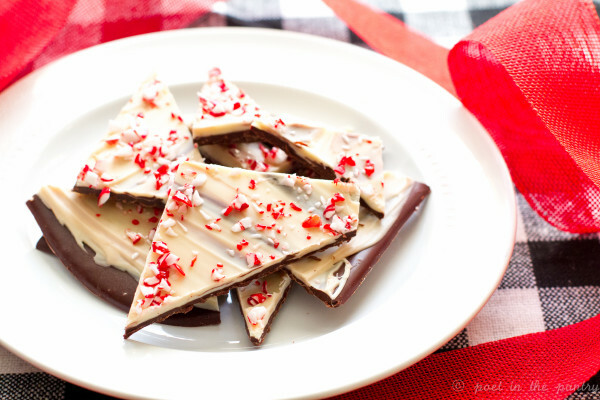 This peppermint bark looks amazing. Wish I was home all day just to make some of these sweet goodies! My favorite dessert is my marshmallow cake. I love making linzer cookies. Thanks for the chance! Carrie, what is an offset spatula? It’s like a long butter knife but no serrated edge—smooth—and it’s at a little bit of an angle so you can spread (frosting, chocolate, etc.) without dragging your hand through it. I believe OXO makes one, and they’re one of my favorite sources for kitchen tools and utensils. Does that help?